COME AND TRY IT OUT – FIRST SESSION £5 or sign-up for our *block discounts*! 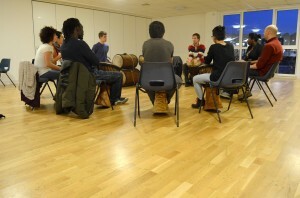 Welcome to our website for African Drumming Classes in south-east London. 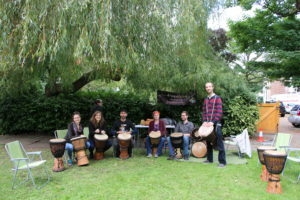 We provide drumming workshops for schools, businesses and institutions in London and the south-east as well as our community evening drumming classes, which have been running since 2010 in Greenwich. If you are a keen and interested Londoner looking for a drumming class to attend, well done you’ve found us! You can learn more about our classes and read about our Drum Africa teachers here. Attendees of our weekly classes can access videos and song lyrics for all the material we learn in our password-protected ‘Members‘ area, and even hire djembes to practise on for just £3 per week! However, if you’re just keen and interested (but not a Londoner), please check out our interesting articles and tuition videos, or be inspired by our videos of Ghanaian drumming and dance troupe Noko Ye Dzen. **NEWS** 09/10/19 DRUM AND DANCE WITH ABRAM DIALLO We’re raising money for Abram’s school building project in Guinea with a special one-off drumming and dance class 8-9:30pm on Tuesday 16th October! Refreshments will be provided for additional donations. Book your place for £10 by emailing africandrumming@hotmail.co.uk now! **NEWS** 04/09/18 AFRICAN DRUMMING IS BACK! 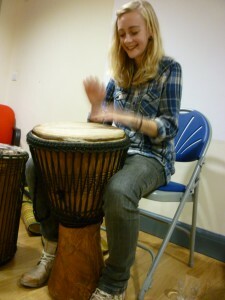 Join us for African drumming classes again starting Tuesday 4th September. We’ll be running until December – check our session dates here. **NEWS** 10/07/18 FINAL CLASS AND SUMMER BREAK! We are taking our summer break, so there will be no class until we begin again on 4th September. Don’t hesitate to email if you’re interested in joining us in September. Have a nice summer! **NEWS** 21/05/18 DANCE CLASS WITH ABRAM DIALLO After an unforgettable Drum Africa and Fore Fote Drumming and Dance cultural holiday to Guinea last month, we are inviting Abram Diallo (aka Fore Fote) back to teach our class to dance Kania Soli this Tuesday 22nd May! £15 drop-in for 1.5 hours of drumming and dance. **NEWS** 21/03/18 OFF TO AFRICA! Next Tuesday 27th March will be our last week before we take a 3 week Easter break, when Laurence and some members of the class will go to Guinea for our exciting African drumming and dance cultural holiday!! The class will return on Tuesday 24th April. **NEWS** 06/12/17 TRIP TO GUINEA! We have very exciting news – we’d like to invite you all to Guinea with us in March-April 2018! Visit our Guinea Trip 2018 page for more information! **NEWS** 05/12/17 SESSION CANCELLED! Unfortunately we need to cancel tonight’s session due to Laurence fracturing his arm. We wish him a speedy recovery! **NEW** 28/11/17 DANCE CLASS We are running an extra special drumming and dance class with Abram Diallo on Tuesday 12th December. Spaces are limited, email us to sign up! **NEWS** 27/10/17 OUR NEXT 6-WEEK BLOCK! We will begin our next 6-week block of classes at Greenwich West Community Centre this Tuesday 31st October. Join us for some exciting new djembe and dundun rhythms! Upcoming session dates here. **NEWS** 16/07/17 FINAL SESSION AND PERFORMANCE! Join us for our final class of term before our summer break. We will be preparing ‘Koma’ and ‘Bobofoli’ for our performance at the Bird’s Nest pub open mic night! After the summer, classes will begin again on 12th September! **NEWS** 17/05/17 MOVED SESSION! We are changing the day and venue of our class next week as Laurence is attending a funeral. The class with be on Wednesday 24th May 7:30-8:30pm at the New Haddo Centre. We will then perform at the Bird’s Nest pub open mic night straight after the class! **NEWS** 02/04/17 EASTER HOLIDAYS We are taking a 2 week break for the Easter school holidays. We will return on 18th Tuesday April with our new set-up! **NEWS** 13/02/17 NO CLASS There will be no classes on 14th and 21st February. If you miss your drumming fix, come along to see TalkingDRUM perform at the Jamboree in Limehouse on Tuesday 21st February, supporting Op Sa! Balkan band. **NEWS** 09/02/17 MUSIC EXPO 2017 Thanks to all the music teachers who came down to Music and Drama Educuation Expo this year and saw Laurence’s talk on how to teach African Drumming the African Way. 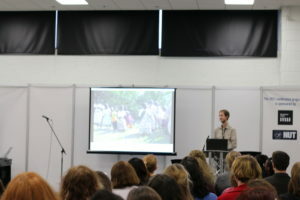 Further teacher training courses are on offer, email theAMSproject@hotmail.com for more info! 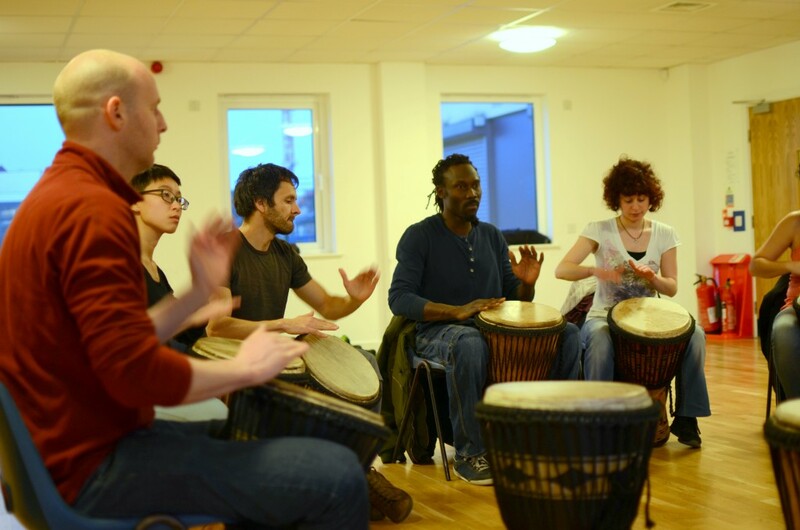 African drumming is a great skill to learn, and a fun way to meet friendly and like-minded people! It is accessible to anyone and everyone with a sense of rhythm and a willingness to learn, a truly enjoyable way to spend an evening! Visit The Classes page to learn more about our sessions.